Inspired by James Watters' blog post on his "fork you" shirt, I decided to revise my planned presentation a bit to talk more about what I hate so much about most academic software. 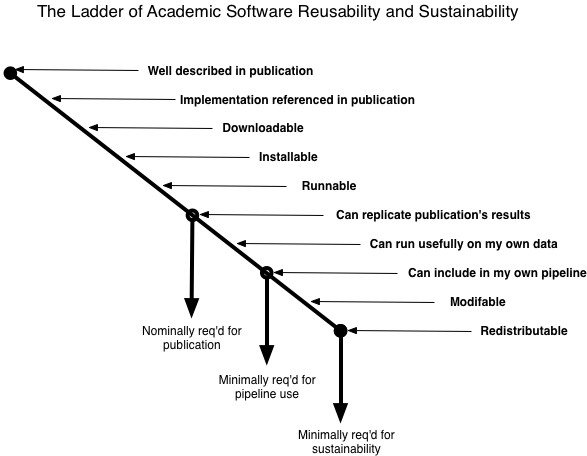 I'll try to write more later, or at least I'll blog after the workshop, but in the meantime: I give you, The Ladder of Academic Software Reusability and Sustainability. My personal experience with software is that approximately 1/2 of all software drops off at each point, which means only 1 in a 1000 make it to the last point -- and the last point is the first point where the software is really forkable. Comments, updates, etc. welcome. Also see the OmniGraffle source.